In Support of DEBRA Canada, in honour of Patient Ambassador Priya Hehn. Date: Tuesday May 1, 2018 to Thursday May 31, 2018. Auction will run for 31 days!!! Join us in participating this DEBRA Canada online silent auction fundraiser in honour of patient Ambassador Priya Hehn. 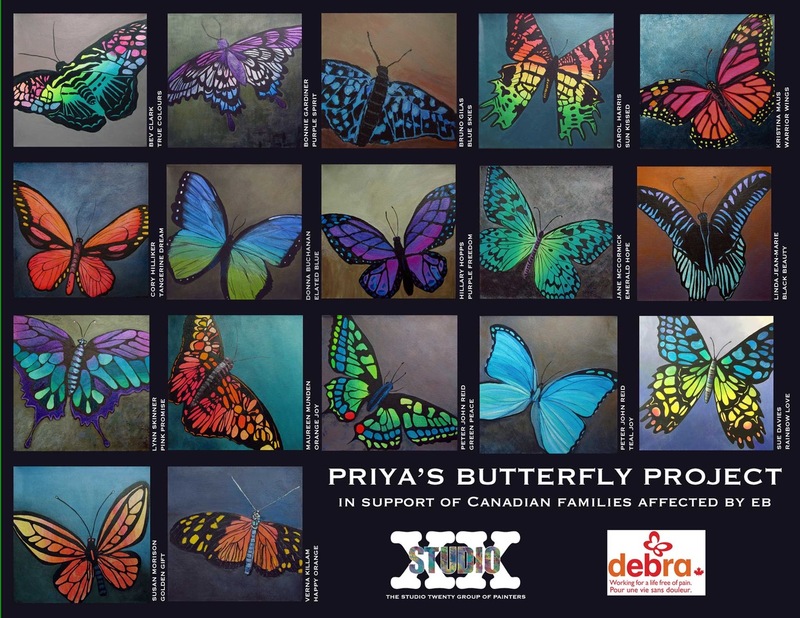 Local artists from Priya’s hometown of Owen Sounds/Walkerton have donated 17 beautiful one-of-a- kind butterfly paintings. You could place a bid and potentially purchase one for yourself or a gift for someone special. The paintings are acrylic paintings, all uniformly sized 12x12 inches, done on quality canvas with an inch and a half profile frame, sides painted, wired for hanging. A small card is included and tucked into the back of each painting with a brief bio on the artist. To learn more about the artists behind each of these beautiful paintings, click here. If you do not wish to place a bid, but would rather donate in lieu of participating, click here.